Ministry of Propaganda - 31/Aug/2004: "Bank Holiday Monday"
While I'm writing this entry my parents should be on a plane from AMS to BRE (I'm saying should because my mother called me earlier to tell me their flight from LHR to AMS was delayed, but I haven't heard from her since). After the largely wasted Saturday (at least for my parents) we managed to salvage some of the weekend: On Sunday we went walking around Avebury. Yesterday (i.e. Bank Holiday Monday) we drove to Courts Garden in Holt. I had visited it in 2001 and my mother thought it looked interesting after seeing my pictures. We had tried to visit it in 2002, for some reason it was closed then. This time we were luckier and it was open. After several showers during the drive to Holt it stayed dry and after a while even the sun decided to come out. 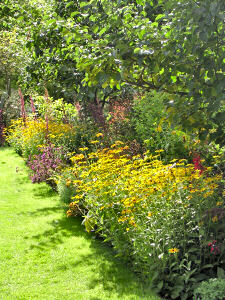 Some of the flower beds were still quite colourful, looking very nice in the sun. We also found a very nice bench protected from the wind by a hedge (sorry, no picture), where we spent quite a while just enjoying the sun and talking. 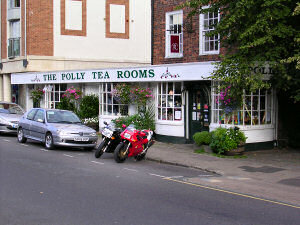 On the way home we took a slight detour via Marlborough, where we stopped at The Polly Tea Rooms for afternoon tea: Cream tea - two homemade plain scones with clotted cream and a choice of strawberry, raspberry, blackcurrant or apricot jam including a pot of tea. Very nice. After that it was time to drive back to Swindon and all too soon time to say good bye again.